Going through files a few years ago, I came across some stuff I had forgotten about. 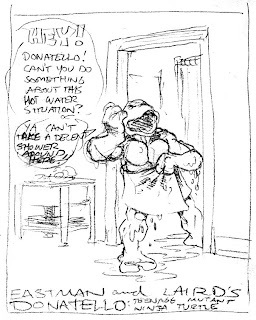 The most surprising thing was a stack of penciled layouts that I did for the DONATELLO Micro-Series. What was surprising to me was how detailed the layouts were -- it was (and still is) very unusual for me to do more than really rough, sketchy drawings for my layouts, but these were almost complete, tight pencils. I think we could have just inked these layouts. But we didn't, instead following our typical practice of enlarging the layouts on a photocopier and light-tabling them onto the Graphix Duo-Shade board for final penciling, inking and toning. Also interesting were two preliminary drawings of the first page -- I really don't know why I did them, as I did not do anything like this for any of the other pages. You should really do a artobiography. -->> .. i hear all the Raphael fan-girls swoon in unison. Pete, you're almost caught up with your old ' Planet Racers ' BFTP re-posts !! !! 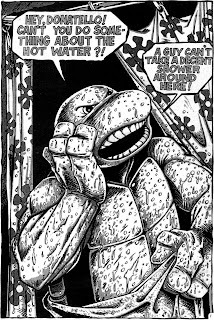 Tokka has a poit, Those Raph fanatics are gonna pounce this blog in unison!! I hope you have tons more behind the scenes tidbits like this. You should do an art book. 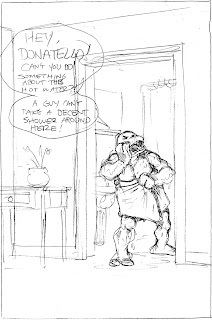 Maybe not like Kev did, but something of your own that we Turtle fans can nab that would compliment our collections. You know, I still have the post cards you guys sent me to let me know that you had recieved my subscription renewal.lol. And I have to ask,have you ever thought about doing a series of novels and novelizations? I'm a geek too!! I love Donny since the original series.